Ever since we moved out of Palms and into the Mar Vista area, we have been spending less time on Venice Boulevard and more time on Washington Boulevard. 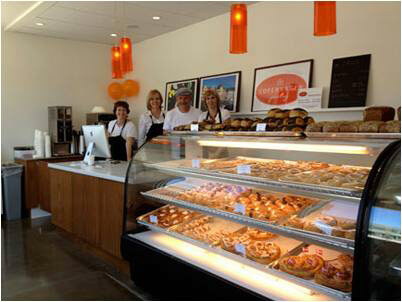 One day, a few months ago, a quaint little bakery caught our eye. A very small storefront with a modern look, hardly more than a display case of pastries followed by a cash register. 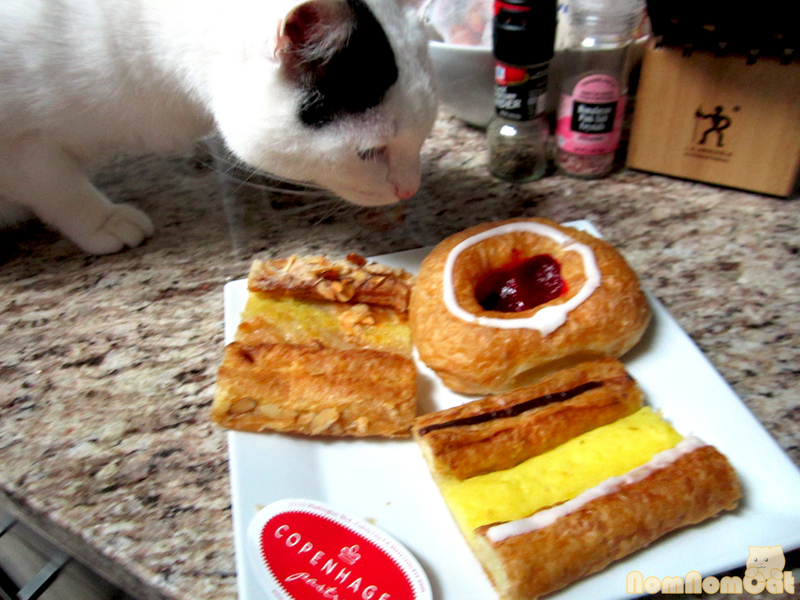 We made a mental note to look up Copenhagen Pastry… and boy, were we impressed! Few places on Yelp manage to maintain a solid 5-star rating over 150+ reviews, so Martin and I knew we just had to check out this adorable little bakery that had recently opened so close to home. 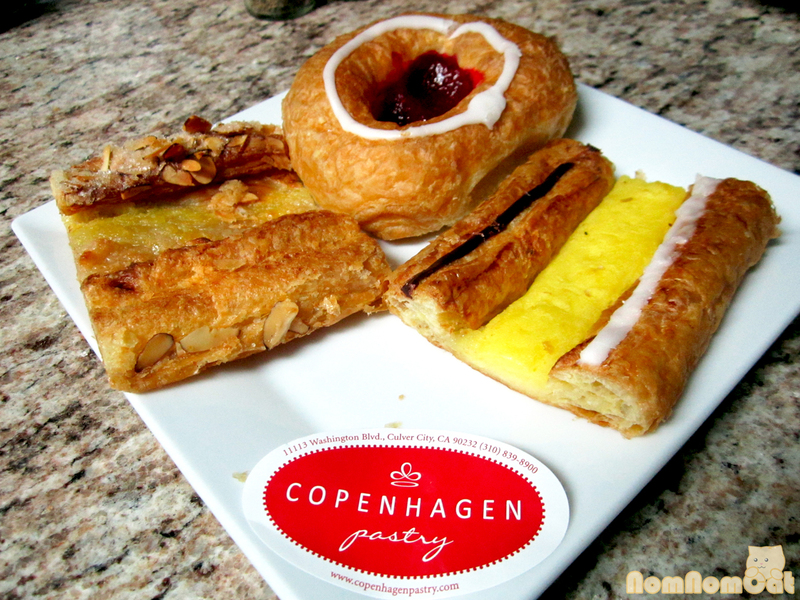 We were welcomed by the women behind the counter as soon as we walked in and they kindly offered us samples of their two most popular must-try pastries: the Copenhagen (a flaky pastry topped with vanilla custard and chocolate – no nuts!) and the Kringle (a similarly flaky pastry but topped with an almond paste & custard blend). On our first visit, we ended up taking home a Kringle, a Chocolate Pastry, and a Cinnamon Pastry… all for just over $5 (which is perfect since we needed to meet the $5 credit card minimum). We have since purchased the “party kringle” on multiple occasions, which, for just $10, feeds 6-8 people. The Copenhagen is a teeny bit on the sweet side for me, but I love the smooth texture of the custard. The Kringle stole my heart at first bite with its garnish of toasted almond slices and crystals of granulated sugar shielding a silky and creamy almond filling underneath. The Cinnamon Pastry (which has no nuts or dairy) resembles a cinnamon roll in appearance with its dollop of white frosting in the center, but it is flaky and crunchy like a cinnamon twist. Another favorite is the Chocolate Pastry — an adorably round ball of puff pastry topped simply with a round dollop of chocolate ganache. The puff pastry is so incredibly flaky that I could hear the layers crackling as I remove it from its paper bag. While all of the pastries are excellent in flavor, I have to say the Chocolate Pastry is the most satisfying to sink my teeth into! The ganache is dark and velvety but not in the least bit grainy or bitter. Perfection! Martin has worked Copenhagen Pastry into his morning routine, relentlessly making me jealous with his picture texts of his beautiful flaky breakfast. 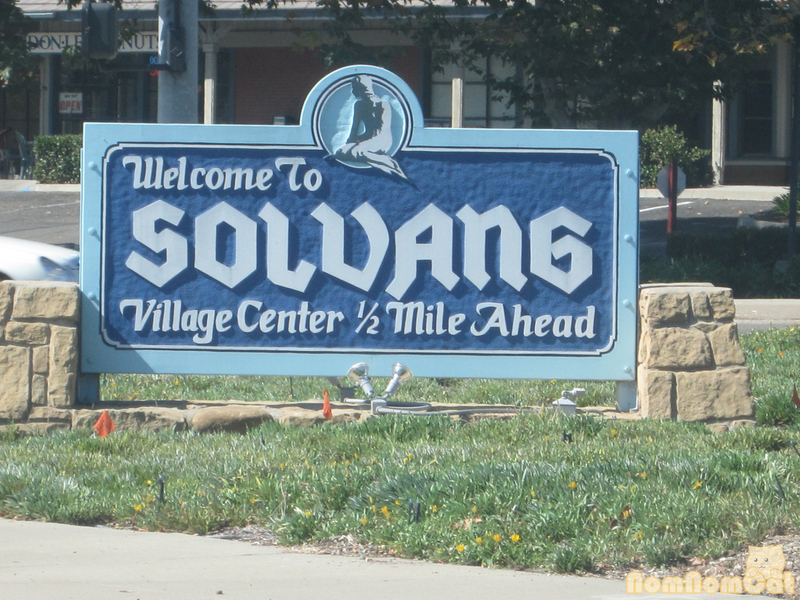 They are open from 7AM to 5PM on weekdays (closed on Mondays) and 8AM to 4PM on the weekends, and they are definitely worth squeezing into your busy schedule. I’m already looking forward to my next visit – and to working my way through the beautiful display of pastries. 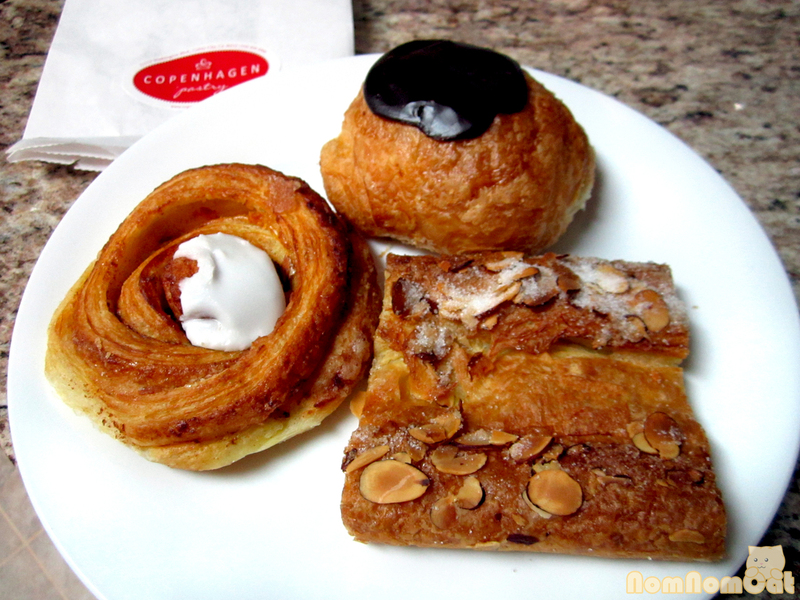 Welcome to the neighborhood, Copenhagen Pastry! 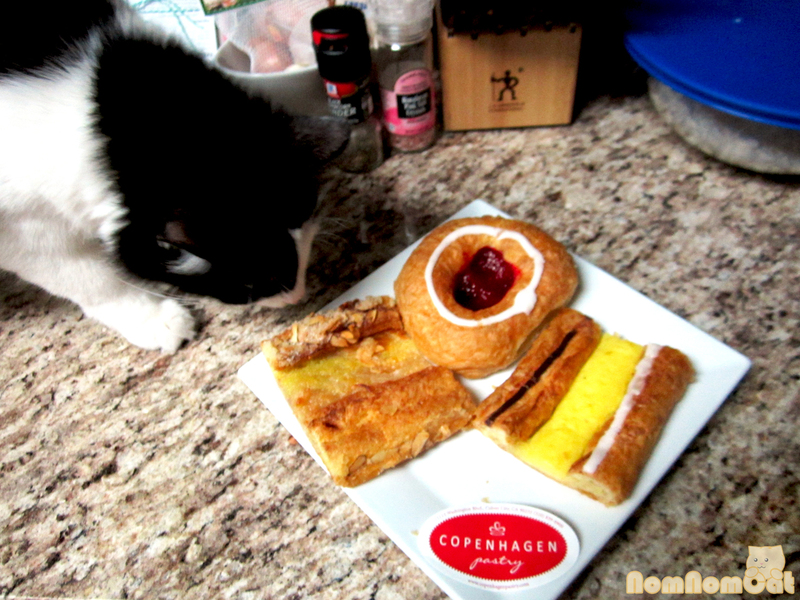 PS: Check out this awesome mini-documentary about Copenhagen Pastry: vimeo.com/61140766. As if the pastries themselves were not enough reason to plan a visit to Copenhagen Pastry, hearing how passionate owner Karen Hansen and head baker Henrik Gram are about high-quality, authentic, nostalgic Danish pastries made with love definitely seals the deal. That’s right, friends. 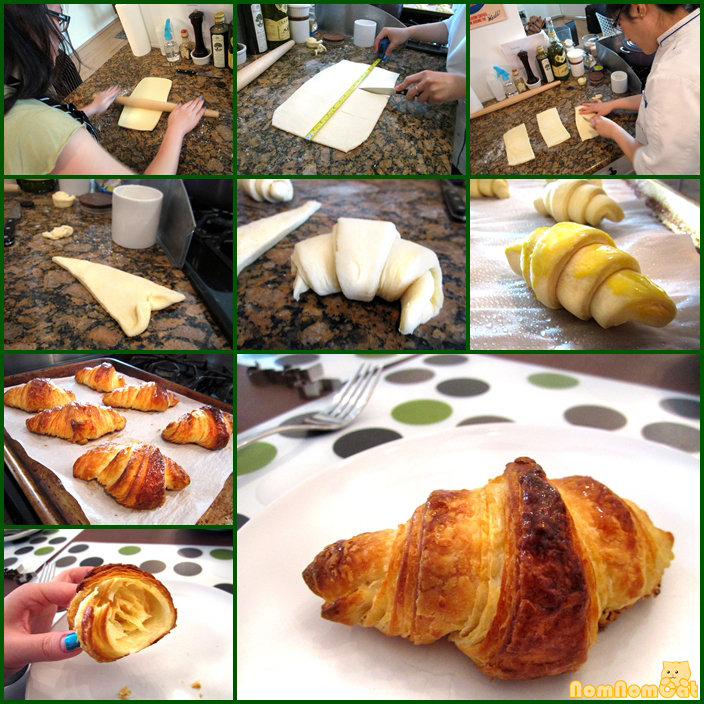 Martin’s Christmas present to me was adding croissants to our culinary repertoire — best boyfriend ever! I was very pleasantly surprised when he proudly announced that we would be taking this class with Elle A Cooking. We spent a wonderful Saturday afternoon covered in flour and butter at Lilia’s place. I had always wanted to take cooking classes and this was a perfect way to start! Lilia’s classes are small, intimate gatherings that move at a comfortable pace, are very hands-on, and encourage lots of picture-taking and question-asking. 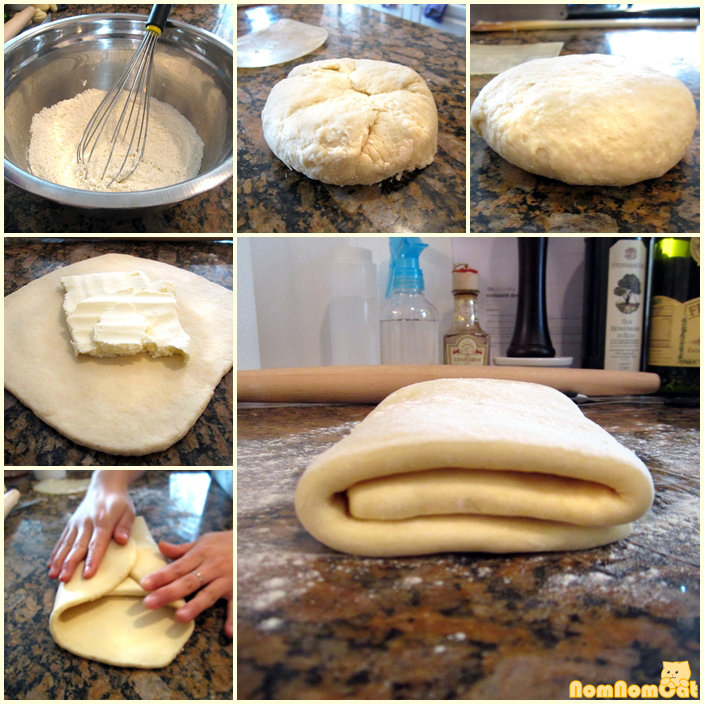 The basic croissant dough. Yes, that’s butter being wrapped up in dough. 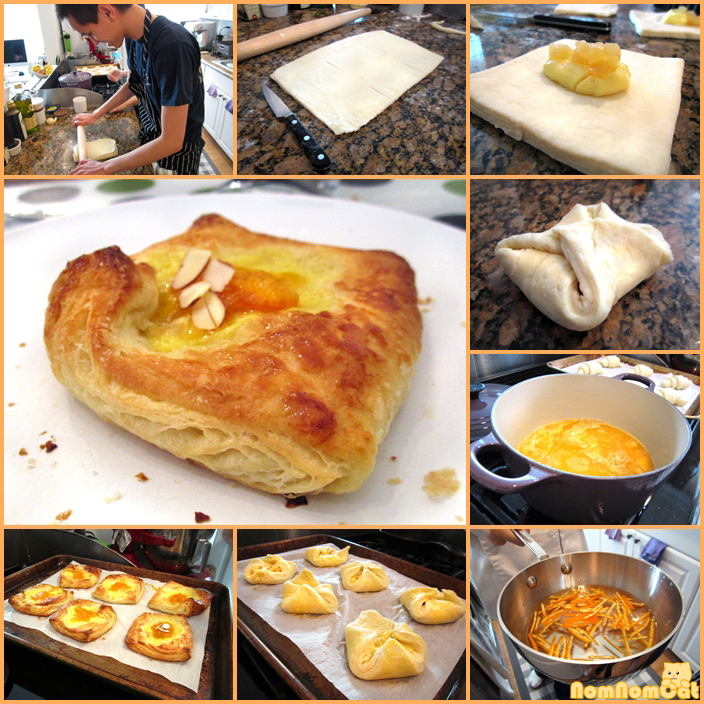 The croissant class menu consisted of croissant dough from start to finish, classic butter croissants, pain au chocolat (chocolate croissants), and quince danish topped with homemade orange marmalade. We worked backwards, using pre-made dough that Lilia had prepared in advance and rolling, cutting, and shaping into our pastries. While they baked, we whipped together a batch of dough from the beginning, let it proof, and wrapped it around a stick of butter. 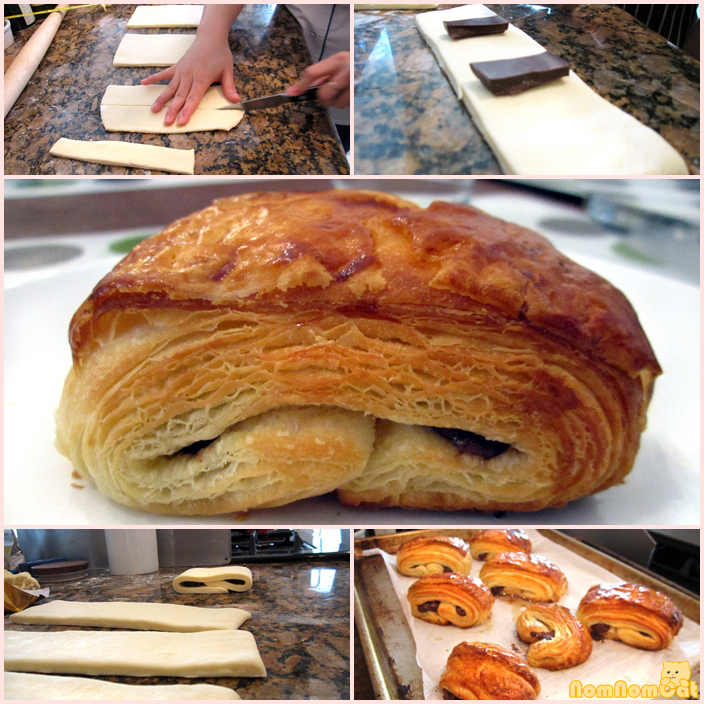 Pain Au Chocolat (chocolate croissants) with Valhrona dark chocolate – yum! Lilia herself has a very calm demeanor and it was a pleasure learning from her. She has a very interesting back story as an engineer who pursued her dreams and attended Le Cordon Bleu in Paris to focus on pastries. I really admire her passion and drive to take hold of her life and take that leap. She even showed us how to make a quick & simple orange marmalade from Satsuma tangerines, intended as a topping for the danishes but nearly polished off with fresh, hot-out-of-the-oven butter croissants. Incredible. Bon Appétit! We wish we could share the recipes with you, but they are not ours to share so you’ll just have to sign up for a class with Lilia to glean her baking secrets yourself. At the end of class, she provides each person with a full set of recipe cards that details the step-by-step process for the dishes prepared that day… super helpful for replicating the process at home! What we are happy to share with you are these mouthwatering pictures of our experience, and perhaps, after a few practice rounds, our advice and findings as amateur pâtissiers. If you’ve ever wanted to learn how to make your own croissants (or macarons or other dishes on her Class Schedule), sign up for a class at Elle A Cooking! We highly recommend it.